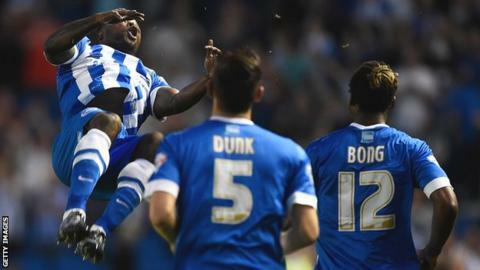 Kazenga LuaLua scored the only goal as Brighton beat Nottingham Forest in the opening Championship game of the 2015-16 Football League season. Winger LuaLua beat Forest goalkeeper Dorus de Vries with a low angled shot five minutes after half-time. De Vries clawed out Tomer Hemed's first-half header, while Forest's Henri Lansbury and Brighton's Beram Kayal both hit the post from outside the box. Brighton's win was their first on the opening day of a season since 2011-12. The Seagulls were good value for their victory, although they survived an early scare when midfielder Lansbury's 30-yard free-kick clipped the post and flew wide. Kayal hit the woodwork with a shot from 20 yards midway through the first half, as Brighton began to seize control. A stunning one-handed stop from de Vries denied Israel international striker Hemed a debut goal in first-half stoppage time, but the Dutchman was unable to keep out LuaLua's low drive just after the interval. Forest, who lost midfielder Robert Tesche to a broken foot in the first period, threatened an equaliser late on, particularly after the introduction of teenage substitute Tyler Walker. Their best opportunity to level came when the hosts failed to deal with a quickly-taken long throw, but Walker could not turn the ball into the net from the resulting scramble. Bobby Zamora, who re-signed for Brighton earlier this week after 12 years away, was not included in Chris Hughton's squad. Brighton manager Chris Hughton: "It is a nice way in which to start the season. It was a typical Championship game, being fairly tight, but we deserved to win it. "Kazenga is a winner and had a good all-round game. You want to see that from your wide players. "I am happy with the performance in general. Forest are a good side, with pace in wide areas. They may have players out injured now, but with that 11 I can see them winning a lot of games this season." Nottingham Forest manager Dougie Freedman: "Unfortunately Robert has broken his foot and it's a big blow. It's the last thing we need right now but it'll give opportunities to others. "I felt we were unfortunate to come in at half-time 0-0 but our concentration let us down soon after the break. After that our response was fantastic. "We worked their keeper and on another night we would have got something out of the game. We went down to a sucker punch and it's important for us to stay focused now." Match ends, Brighton and Hove Albion 1, Nottingham Forest 0. Second Half ends, Brighton and Hove Albion 1, Nottingham Forest 0. Foul by Chris O'Grady (Brighton and Hove Albion). Corner, Brighton and Hove Albion. Conceded by Eric Lichaj. Attempt missed. Solly March (Brighton and Hove Albion) left footed shot from the left side of the box is too high. Assisted by Liam Rosenior with a through ball. Jamie Paterson (Nottingham Forest) wins a free kick in the defensive half. Substitution, Brighton and Hove Albion. Liam Rosenior replaces Kazenga Lua Lua. Corner, Brighton and Hove Albion. Conceded by Jack Hobbs. Attempt blocked. Kazenga Lua Lua (Brighton and Hove Albion) right footed shot from outside the box is blocked. Assisted by Dale Stephens. Chris O'Grady (Brighton and Hove Albion) wins a free kick on the left wing. Attempt missed. Tyler Walker (Nottingham Forest) right footed shot from outside the box is close, but misses to the left. Assisted by Eric Lichaj following a set piece situation. Tyler Walker (Nottingham Forest) wins a free kick on the right wing. Attempt missed. David Vaughan (Nottingham Forest) left footed shot from outside the box is high and wide to the left. Assisted by Henri Lansbury. Substitution, Nottingham Forest. Jamie Paterson replaces Jamie Ward. Attempt missed. Michail Antonio (Nottingham Forest) header from the centre of the box is close, but misses to the left. Assisted by Henri Lansbury. Attempt blocked. Dexter Blackstock (Nottingham Forest) header from the centre of the box is blocked. Assisted by Henri Lansbury with a cross. Corner, Nottingham Forest. Conceded by Lewis Dunk. Attempt blocked. Tyler Walker (Nottingham Forest) right footed shot from a difficult angle on the right is blocked. Attempt saved. Tyler Walker (Nottingham Forest) right footed shot from the right side of the box is saved in the bottom right corner. Assisted by David Vaughan. Attempt missed. Henri Lansbury (Nottingham Forest) right footed shot from outside the box is high and wide to the right. Assisted by Jamie Ward following a set piece situation. Michail Antonio (Nottingham Forest) wins a free kick in the attacking half. Jamie Ward (Nottingham Forest) wins a free kick on the right wing. Attempt missed. Tyler Walker (Nottingham Forest) left footed shot from the centre of the box misses to the right. Assisted by Michail Antonio. Attempt missed. Solly March (Brighton and Hove Albion) left footed shot from the right side of the box misses to the right. Assisted by Tommer Hemed with a headed pass. Substitution, Nottingham Forest. Tyler Walker replaces Daniel Fox.